What comes to mind when you think of helping people in your community? In the words of the National Service Learning Clearinghouse, it is “a teaching and learning strategy that integrates meaningful community service with instruction and reflection to enrich the learning experience, teach civic responsibility, and strengthen communities”. A non-profit organization has the purpose of aiding the community with humanitarian work, community service and help those in need. They do not receive profit for their work, but they are funded to do so. There are 1,000 nonprofits registered in El Paso and all are typically looking for volunteers at all times of the year. Submit a copy of your finalized timesheet to ccesl@utep.edu. 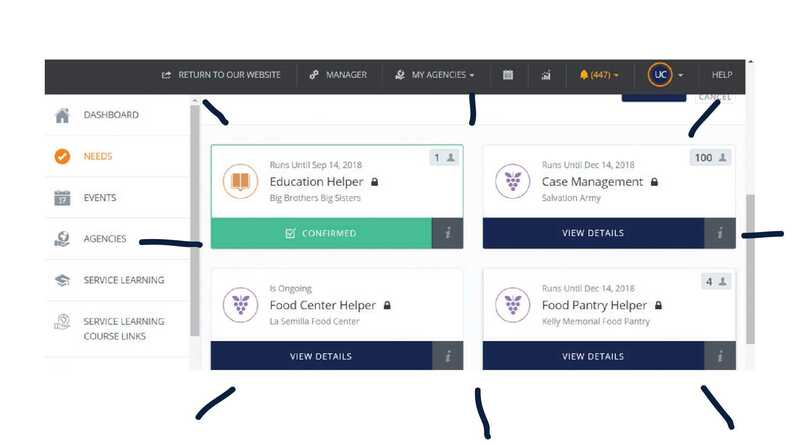 A CUE account will allow you to sign up for an agency site, review opportunities listed, and track your hours. 1. 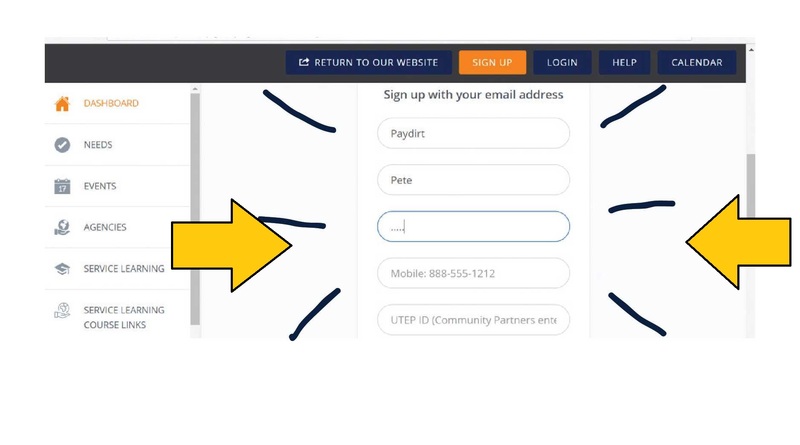 Log in to cue.utep.edu with your "UTEP username and password"
5. 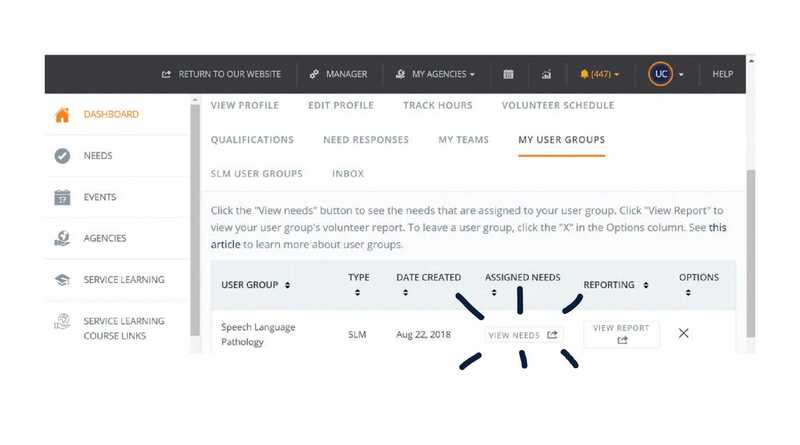 Under my user groups click on "view needs"
6. Under needs, select a program that appeals that appeals to your needs and interests. Our programs are designed to not only aid our community, but to contribute to the education of those involved. Please select a program that you feel will benefit your student experience, and help you grow as an individual. Training: It's time to KAHOOT! Please wait for your CCE representative to provide you a game pin for the following Training Questions. 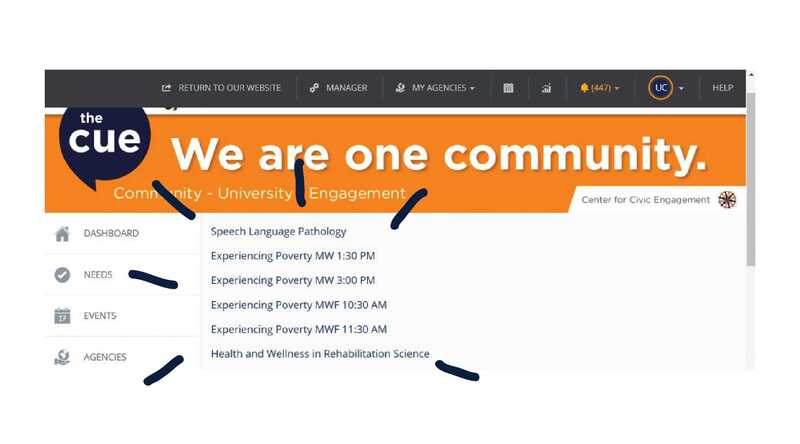 The site’s contact information may be accessed on cue.utep.edu under the Service Learning Course links tab. Sites have been pre-selected by your UTEP Professor. for your class and their respective contact information. a. Background Check; Application Process; Orientation/Training; etc. Deadline to turn in your completed Time Sheet is the end-date for your course on the CUE. You will record your hours on your Timesheet and on the CUE. Please verify with the Center for Civic Engagement (CCE) to make sure everything is completed. The CCE will submit a report to your professor indicating completed hours the following week. Get oriented - Know course specific instruction and deadlines to meet. Understand requirements - timesheets, release identification forms, contracts, and assignments. Make contact – Understand community need. Find contact Information on CUE (http://cue.utep.edu). Contact agency as soon as possible! Explain who you are and what you are about. Leave voice mail and be consistent until you get a response. Contact CCE if no response. Be open minded about different experiences and perspectives. Ask if you need to receive an orientation. Request a get a tour of the site (if available). Speak about being assigned specific, meaningful, and appropriate tasks. Call supervisor if you are unable to attend. (you may be terminated from your site if you fail to call or show-up). Follow through with commitments (time, tasks, etc.). Do ask for help when in doubt. Do avoid the responsibility of handling money. Don’t give (or loan) money or share personal information. Do contact the CCE if you need help (cce@utep.edu). Get the MOST out of your Service Learning experience this semester! Although at times it may be hard to fit service into an already packed student schedule, try your best to leave any outside negativity at the door. Your community patrons will appreciate your assistance even more if you manage to be kind and positive in their time of need. You never know when traffic or other outside issues may get in the way of arriving to your destination on time, so it is best to plan ahead. Please research the location of your host site prior to your first serving opportunity, so that you may ensure you arrive on time. Our programs are designated to not only aid our community, but to contribute to the education of those involved. Please select a program that you feel will benefit your student experience, and help you grow as an individual. 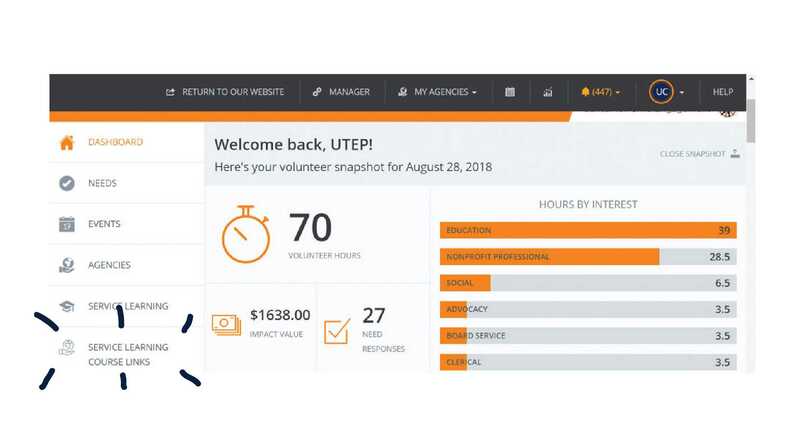 Due to the sensitive nature of some of our host sites, it is highly important that you always carry identification indicating not only who you are, but your status as a UTEP representative. This is crucial in maintaining the privacy and protection of our organization's patrons. 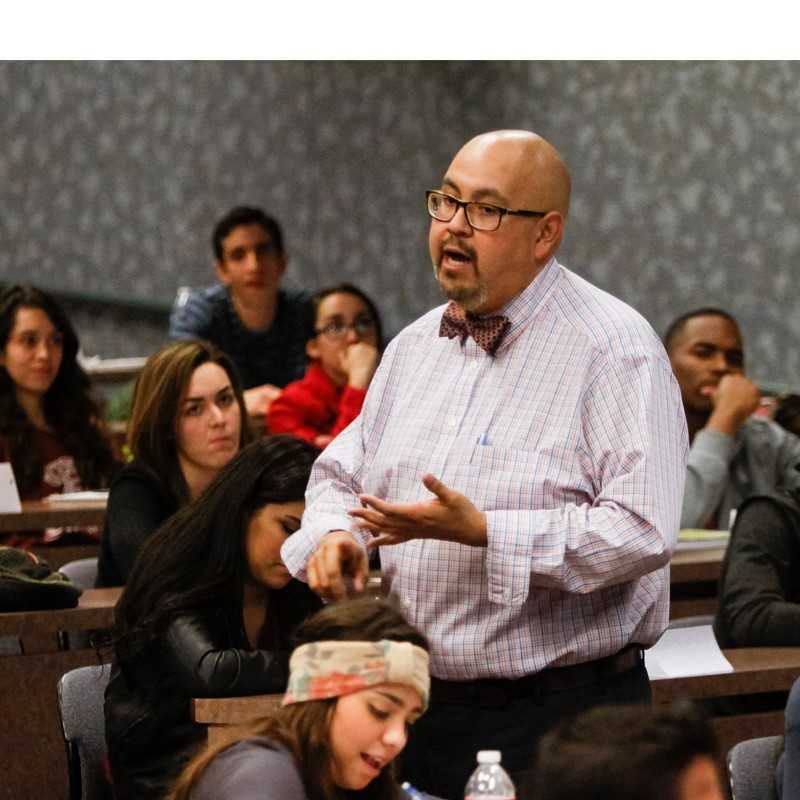 As a student representative of the University of Texas at El Paso, it is important that you maintain the high standards of professionalism and accountability that our institution cultivates and expects. Always remember that our community patrons deserve the same level of respect and courtesy that you would expect others to extend to you. Please remember that this service experience is intended to serve as a learning opportunity for you as a student. If you are tasked with a duty that you are not familiar with, do not hesitate to ask for help and guidance from your host site representatives. Do not overcommit to more service time than you can handle! Although you may love your service experience, please do not overcommit your schedule. Both you, and your organization suffer if your time and energy level are spread too thin. How to add your hours to the CUE? Make sure to get your timesheet filled out and signed by a supervisor. Don’t forget to add your total hours completed. Add Service Learning to your Resume! Q1. Why is this training important? Q2. About how many nonprofits are registered in El Paso? Q4: Service Learning is NOT? Service Learning is a dual learning process, where what you learn in the organization is applied to your class and vice versa. Q5. Your Service Learning experience begins when? Once all required training's and background checks are completed you may start your Service Learning experience. Q6. When will you complete training? A: Depends on which Service Learning opportunity you registered for. Some organizations may ask you to attend an extra training that is required in order for the student to start. Q5. Why is it important to review site requirements? Q6. How will I know if I need a background check? Background checks are required for certain agencies, mostly if you are working with children or a public agency. There is no fee charge for the student to have a background check, it will be taken care of by the university. Q6. Good form of Service Learning might be? Q7. What are added benefits of Service Learning? Q8. A bad form of Service Learning might be? A: Not attending site without notice, Switching site options if you don't like the first one, tell the site "I am only doing this because I HAVE TO"
Q9. What should you do if you are not happy at your site? Q1. Can I do Service Learning with my community church? This answer varies depending on your professor. Please speak with your professor, if he/she allows it, then email the CCE office (cce@utep.edu) with your information letting us know that your professor allowed you to complete the hours at your community church (Please copy your professor on the email). Q2. What if I encounter problems while doing Service Learning in the organization? 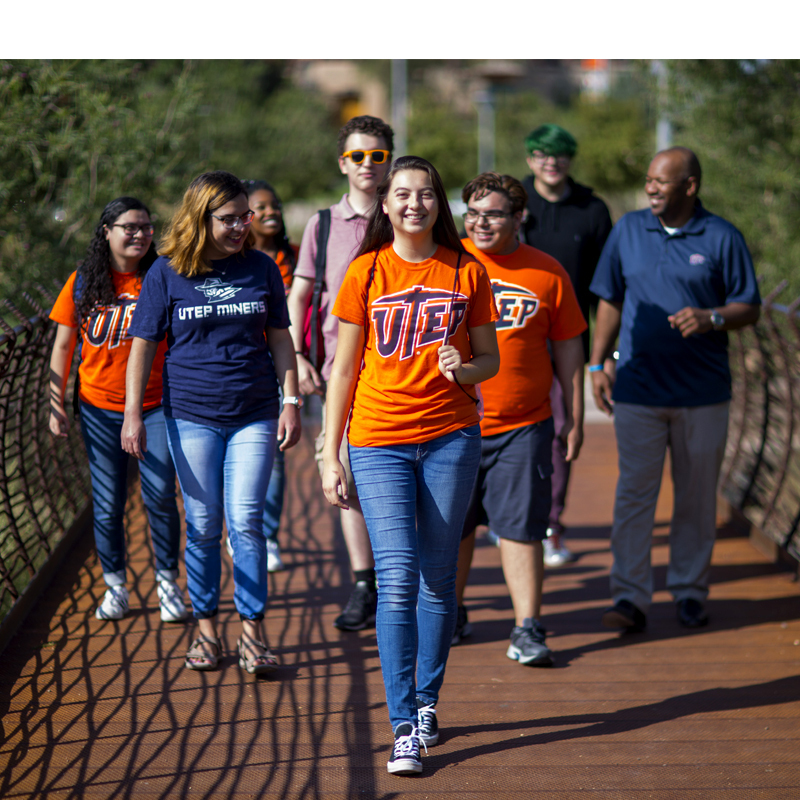 If you encounter any problems or are concerned about something that you would like to communicate with us, please request a meeting with our Service Learning coordinator by calling our office at 747-7969 or by e-mail at cce@utep.edu. We will gladly help with any issue in order for you to be able to complete your service-learning hours. Q3. Are there any Service Learning opportunities during the weekends or after 5pm weekdays? We have worked with organizations that allow students to do their service-learning hours during the weekends. Please ask the agency manager for your service-learning opportunity if they have flexible hours. Q4. When is the last day to complete Service Learning hours? The last day to turn in your service-learning hours log sheet will be different for each course. You may find the date by logging onto the CUE and navigating to your Service-Learning course or on your course syllabus. Q5. Can I still do Service Learning even if it is not required for a course? Yes, however, it is not known as service-learning but instead, as a volunteer opportunity. 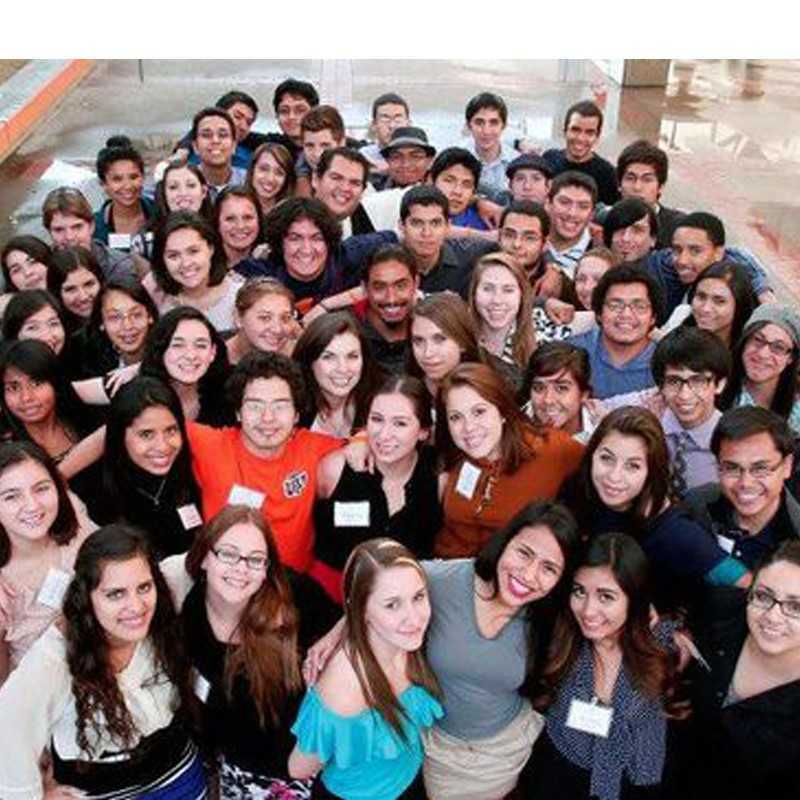 The CUE has several volunteer opportunities listed from organizations that have a need for UTEP students to assist them. Q6. Can I continue to do Service Learning after I complete the my course required hours? Yes, even though it is not required, we highly encourage students to continue doing service-learning with the same organization after the required hours of the semester are completed.If you would like to continue tracking your hours then please visit our office and we will set-up a volunteer opportunity for you on the CUE. Q7. How do I receive the certificate of achievement at the end of the semester? You may come by our office to pick up your certificate of achievement. Q8. When will my professor be notified that I completed Service Learning hours for course credit? Your professor has access to the CUE and may see your service-learning hours at any time. However, we will notify your professor that you completed service-learning hours one week after the paperwork deadline. Q9. 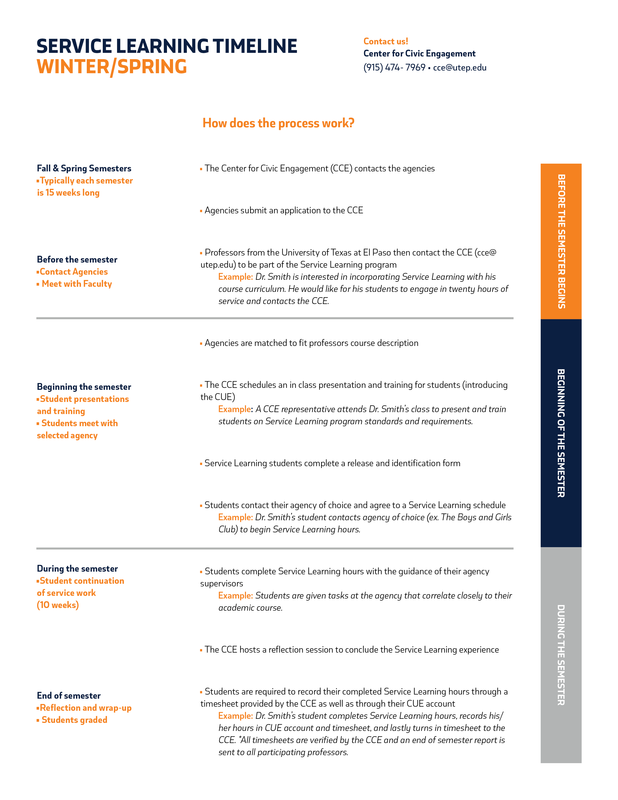 How can I retrieve my CCE Service Learning hours? We are only using the CUE to track service-learning hours. 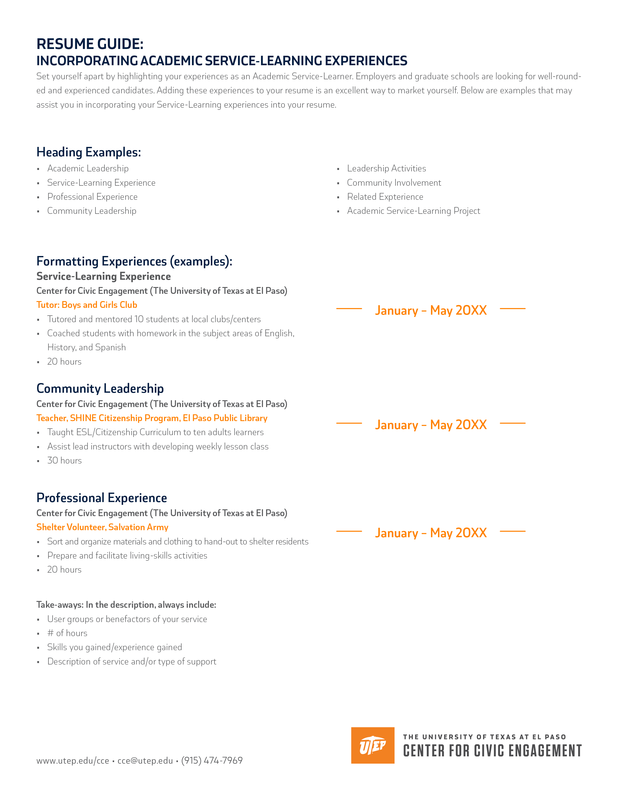 You may download your volunteer resume on the CUE for a list of all your service-learning hours. Q10. I missed all the scheduled CCE program training's. What can I do? If you have missed all the training's offered for the programs your professor selected, you may ask your professor for an alternative program or you can contact any of our staff members by calling the CCE office and request a one-on-one training. Q11. Can I do Service Learning in more than one program to complete my requirements? In order to get full credit, you must register, attend the training, and complete your professor’s service-learning requirements in one program. In other words, you may not mix and match programs to complete your hours. Q12. What happens when I am done with all my Service Learning hours? Once you have completed all of the hours that are required by your professor, you may want to double check with the CCE staff to make sure that all of your required hours have been recorded properly. Once you have done this, the CCE will give your professor a report at the end of the semester that states that you have completed all of the hours that were required. Q13. Do I need to sign up for training even though I completed Service Learning hours last semester? If you did not change the program but decided to change the organization you do not have to receive training. If you did however change the program, you are required to be trained on the new program of your choice. Q14. How many hours of Service Learning do I have to complete in order to receive course credit? This answer depends on the professor that is offering you service-learning. For almost all of the professors, the requirement is 20 hours including on-site training. If you have any doubts, please check with your professor for clarification. Service Learning is a teaching method for students to gain academic content while also serving the community. Service Learning serves the student, community, and the faculty member; it allows us to expand our university and to work alongside our community. Service-Learning consultant model is used in order to provide students an opportunity to apply their skills that they are building in statistical modeling and also work in service and with community organizations so that their expertise can have impact. If a faculty member is interested in participating or incorporating Service-Learning in their class, we are here to help make that happen. Working in a Service-Learning capacity is confidentiality and to protect the integrity of confidentiality of that agency. Service Learning is not volunteerism, it has an academic component to it. Partnerships is about starting where people are, finding ways of coming together to identify mutual interests not always needs, but mutual interest and it's a long-term relationship. Being engaged in Service-Learning and learning about the history of a community, the culture, being active, developing relationships with people in the community is really at the heart of our profession. In being able to help the students connect what we teach in the classroom, what we help them to learn, they can actually see in the community through real-life experiences. Reflection is really important, you don't separate your reflection from your observation, they go hand in hand. First step is finding a community organization whose focus area directly relates to the course content in the particular course that you want to offer service learning in. Like most experiential learning, the student gains more by reflecting upon their experiences than simply by going through them.